The Fairmont Chateau Lake Louise has long been the stomping ground of celebrities and royalty, from Marilyn Monroe to Prince Rainier of Monaco. You never know who you might encounter on a stroll around the lake. From its inception in 1890 as a one-story log chalet on the shores of Lake Louise, to its current incarnation as a towering, 550-room grand lady, The Fairmont Chateau Lake Louise has always been an impressive and imposing base from which to experience the natural beauty of the Canadian Rockies. 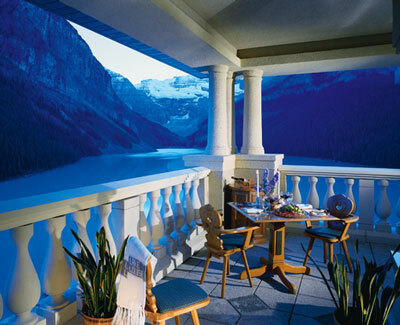 Tucked deep within Canada's wild Banff National Park with majestic snow-capped mountains as its backdrop, Chateau Lake Louise truly has captured, through massive floor-to-ceiling windows, what one intrepid 1882 explorer called "a matchless scene." Guests have the choice of enjoying nature's wonders on their own, or availing themselves of the outstanding guided Mountain Heritage Adventures program. Learn to mountain climb under the tutelage of skilled professionals. Mush a team along a 20-kilometer dog-sled run to the Continental Divide. Experience the awe and absolute stillness only nature can provide with a hushed cross-country ski. Shush through a different terrain every day at one of the three nearby, world-class downhill ski areas . While the hotel's back door leads to unparalleled adventure, its front door bespeaks unpretentious luxury. After a rigorous day in the captivating wilderness, step into stylish terrain and dine on exceptional Alberta beef and bison at the Tom Wilson Steakhouse, or tap into the hotel's Alpine roots with a fondue or raclette at Walliser Stube. Loosen sore muscles with an Elemental Nature Massage at the Escape Spa & Salon, or simply relax in the hot tub or heated indoor pool. Then settle in for the most amazing night's sleep ever, brought on by your exposure to achingly crisp mountain air and soothingly soft down comforters. All told, it's an alpine experience you won't soon forget.